After a 3-4 day against the Red Sox on a day game at Fenway yesterday, Davis officially ended his streak of going 0-54. Against former Cy Young award winner Rick Porcello no less. Now the longest hitless streak for a position player, who got the first hit since September 18, 2018. Davis had signed a 7-year $161MM deal before the 2016 season. Yesterday top prospect Touki Toussaint has been recalled from Triple-A Gwinnett to man a post in the Atlanta bullpen. Touki came up for 5 starts at the end of last year and struggled with his command. He does have a top notch fastball and curve, but getting it in the zone has always been his issue. In shorter stints we will see if he can focus in a bit more, because his stuff is there to succeed. Veteran OF Carlos Gonzalez has been called up to play in the Cleveland outfield. After being with the Rockies for the past 10 years, he will now be putting on an Indians jersey. The former MVP candidate and All Star will be called upon to help ease that dumpster fire of an outfield and lineup. When a club “non-tenders” a player, it declines to give that player a contract for the upcoming season, thereby immediately making him a free agent. Players on the 40-man roster with fewer than six years of Major League service time must be tendered contracts each offseason by a set deadline — typically a date in early December — or non-tendered and released to the free-agent pool. In many instances, a club will non-tender a player because it feels the raise he will receive in arbitration would be greater than his on-field value. In other cases, a club will non-tender a player simply to clear a spot on the 40-man roster — even if that player isn’t due much more than the league minimum the following season. Henderson Alvarez was due to receive $4 million or more in arbitration following the 2015 campaign, in which he made just four starts before undergoing season-ending shoulder surgery. Rather than tender a contract to a player with major durability concerns, the Marlins non-tendered Alvarez in December 2015. Also in December 2015, the Astros elected to non-tender first baseman Chris Carter rather than pay him a raise on his $4.175 million salary from the prior season. Carter had belted 90 homers with Houston from 2013-15, but he also batted just .218 while striking out in 33.7 percent of his plate appearances during that span. And though James Jones was not eligible for salary arbitration and would have made scarcely more than the league minimum in 2016, the Rangers non-tendered him in December 2015 to open a 40-man roster spot for further offseason maneuvering. Texas soon re-signed Jones to a Minor League contract, keeping him in the organization without expending a 40-man roster spot. Joining what appears to be half the team, is headed to the IL with a left calf strain. He is anticipated to only need to be out the 9 days required (since the IL stint is retroactive to Wednesday), but having Sanchez off to such a hot start doesn’t bode well for the struggling Yankees. After further reports, today GM Brian Cashman announced that relief ace Betances has a bone spur in his shoulder. He will have three weeks of rest then will be re-evaluated. The timeline, if all goes planned, is to be back in game action within 6-8 weeks. A non-roster invite (NRI) is an invitation for a player who is not on a club’s 40-man roster to attend Major League camp in Spring Training and compete for a roster spot. Clubs can extend NRIs to their upper-level Minor Leaguers and also include NRIs in Minor League contracts given to free agents in the offseason. In February 2015, the Kansas City Royals signed left-hander Franklin Morales to a Minor League contract with an invitation to Major League Spring Training. Morales attended Spring Training with the club and won a roster spot with a strong performance. He went on to post a 3.18 ERA in 62 1/3 relief innings for the eventual World Series champions. I hope you liked today’s Special Cookie!! Trout is a beast and that contract looks to be an underpay, for a such an amazing player. The Astros and Star third basemen have come to terms for a 5 year, $100 MM extension that will begin after this season. Spanning 2020-2024, that will buy out his three arb years, and two free agent years. Bregman is one of the primer players in the game and even got him enough recognition that earned him 5th in the MVP voting for the American League. Only 25, he has really ascended to the top of the ranks since being the number 2 overall pick in 2015 out of LSU. What could become one of the best bullpens of all time, the Brewers (the *one* team that probably doesn’t need another bullpen arm) are rumored to be talking to Closer Craig Kimbrel. One thing that really jumps out to me first off, is that Craig has voiced his opinions of being used as a 9th inning only guy in the past. The Brewers (and the Rays) have really pioneered the creative bull penning that strikes this game today. One has to wonder if he would change his opinions and come into a tight situation in the 7th inning, for example. Man, the backend of a bullpen with Josh Hader, Corey Knebel, Jeremy Jeffress and Craig Kimbrel sounds so daunting. Puts them atop the NL Central in my book if they can pull it off. At the beginning of the offseason, it was reported that Kimbrel was looking for a 6 year, $100MM contract. The Brewers are already projected to have a franchise highest payroll entering 2019: at $127.5MM, so it looks to be like Kimbrel has come down some from that, as a lower revenue team such as Milwaukee to be linked to him. Since they will already be surrendering their top draft pick in 2019, they would only have to give up their next pick to sign him. Less than most other teams. (Don’t get me started on having to surrender draft picks to sign free agents, rant for another day). Another Astro extension happened today. Setup man Ryan Pressly was inked to a 2 year/ $17.5 MM. Like Bregman’s deal, it does not kick in until 2020, making him cheaper for this year; allowing the Astros to make more in-season moves without going over the Luxury tax threshold. Since getting traded to the Astros this past trade deadline, he really came into his own. It looks as though that the Astros and their cutting edge tech saw something in him; Pressly pitched to a 0.77 ERA once he got to Houston. He turned into a legit bullpen ace. Both Jeremy Jeffress and Jimmy Nelson will open the season on the injured list, Brewers president of baseball operations David Stearns confirmed today. Jeffress is only trying to build up arm strength and is not injured per se. In another Yankee ruled out for opening day (Sabathia, Severino, Ellsbury, Gregorious) and now Dellin Betances, he is facing an impingement and inflammation in his throwing shoulder. (HR-DIS) Projected Home Run Distance represents the distance a home run ball would travel if unhindered by obstructions such as stadium seats or walls. This metric is determined by finding the parabolic arc of the baseball and projecting the remainder of its flight path. Projected Home Run Distance is a pivotal tool when comparing individual home runs. Looking at Hit Distance alone is not an optimal practice for comparing home runs. This is because each stadium has unique obstructions that prevent balls from completing a full flight path. Of course, Major League stadiums have different climates, dimensions, wind currents and elevations, which affect the distance batted balls travel. But comparing the distances of monstrous home runs has long been a hobby of baseball fans. And Projected Home Run Distance gives us a slightly fairer way to do that. Finally, another free agent off the board. In a tweet from Jeff Passan of ESPN, he details that this is (surprisingly) a minor league deal! it is crazy that a player his caliber has to settle for a minor league deal. Last year he ended with a 4.16 FIP, which is NOT bad by any means. After a run with the Nationals in which he had a 3.28 FIP over three years previous to 2018, it seems like there should be some left in the tank. Gio’s deal is for $3MM plus incentives. Earlier in the offseason, there were numerous reports that the Indians were shopping their two top pitchers, Kluber and Bauer, around to see if they could dump a salary or two. Since Christmas or so, those talks seemed to subside. After today’s tweet from Ken Rosenthal, they have picked back up: this time with the Padres. Ken does point out that he does not think this would happen before Opening Day next week. Dustin Pedroia will not be ready for Opening Day. Definition: A Bolt is any run where the Sprint Speed (defined as “feet per second in a player’s fastest one-second window”) of the runner is at least 30 ft/sec. Players’ Bolt totals for each season are displayed on the Sprint Speed leaderboard. It is a cumulative stat, unlike Sprint Speed. Billy Hamilton finished first or second in Bolts in each of the first four seasons in Statcast history. Trea Turner ranked first in 2018, with 145 Bolts — 43 more than any other player — though he ranked fourth on the Sprint Speed leaderboard (min. 10 competitive runs). Since Statcast was implemented Major League-wide in 2015, the number of Bolts per season typically has been similar to the number of stolen bases. For example, there were 2,377 Bolts and 2,474 steals in 2018. TLDR: If a runner crosses 30 ft/sec he will tally a bolt. Only the fastest of the fast get that. Today, a free agent thought to have had a place to go on a major league deal, signed a minor league deal with the Indians. Carlos Gonzalez used to be a staple in the middle of the Rockies lineup, but the past few years has slid back a bit. While he could make up to $2MM if he makes the big leagues, it is still risky if the Indians cut him in the next two weeks. Lets hope CarGo kept in shape over the offseason. Gio Gonzalez, one of the top three free agents left, is now hearing some rumors of a Yankee connection. With Severino and CC Sabathia not ready for the season, they are looking to turn to two rookies: Domingo German, and Luis Cessa. While they are planning to have their regulars back by May, that is still over a month without them, and heaven forbid another starter go down during the season, you never can have too much pitching. Introduced before the 2017 season, Hit Probability is a Statcast metric that measures the likelihood that a batted ball will become a hit. Each batted ball is assigned a percentage based on how often comparable balls have become hits since Statcast was implemented Major League wide in 2015, using exit velocity, launch angle and, on certain types of batted balls, Sprint Speed. (As of January 2019, Hit Probability now factors in a batter’s seasonal Sprint Speed on “topped” or weakly hit” balls.) For instance, a line drive to the outfield with a Hit Probability of 70 percent is given that figure because balls with a similar exit velocity and launch angle have become hits seven out of 10 times since the implementation of Statcast. Barrels — a metric introduced in 2016 — have a combination of exit velocity and launch angle that results in a minimum Hit Probability of 50 percent, though the Hit Probability of the average Barrel is much higher (82 percent). Why it’s useful:Hit Probability tries to get to the heart of what a pitcher and hitter control while attempting to take out the effects of defense and ballpark. Setting aside foot speed for infield hits, a batter’s impact on whether the ball was a hit or an out ends as soon as the bat makes contact. Likewise, a pitcher cannot control what happens to a batted ball after it leaves the bat. With knowledge of the probable outcome of each batted ball, an expected wOBA can be created for each player — factoring in non-contact figures like a player’s strikeout and walk rates. TLDR: Hit probability is what it sounds like: the chance a hit would be a hit. Sometimes batters get lucky. Bryan Hoch of MLB.com reported today that Brian Cashman told the media that Ace Severino will not see major league action until at least May. Thats a major blow to the Yankee rotation. Newly traded for Paxton will look to be the star of the staff until Severino comes back. Paxton is a great pitcher in his own right when healthy, he is no Severino. Today manager Dave Martinez told the media that OF Michael A. Taylor has a sprained knee and hip. While of course that is not good news, Martinez said that Taylor is expected to miss a significant amount of time. Jess Doughtery of the Washington Post was the bearer of bad news here. Unless Adam Eaton comes back healthy soon, I could easily see them turn to a trade; if this had happened a few days previous, I could have seen Washington spend $3 for Adam Jones. Statcast defines a ‘hard-hit ball’ as one hit with an exit velocity of 95 mph or higher, and a player’s “hard-hit rate” is simply showing the percentage of batted balls that were hit at 95 mph or more. Why 95 mph? 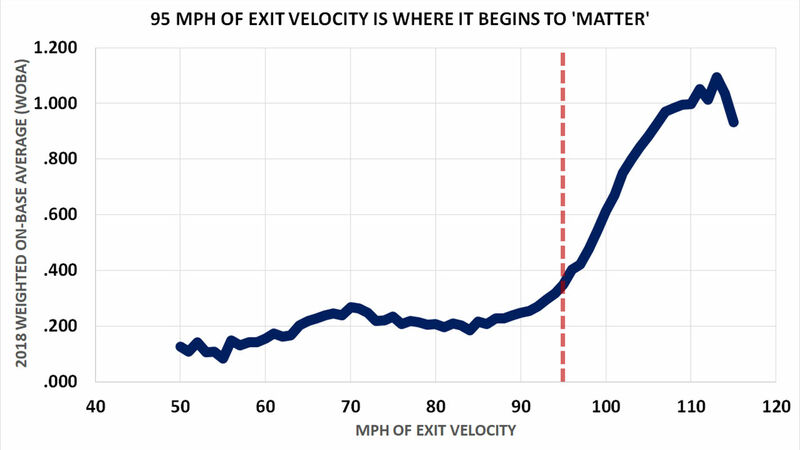 Because, as the image below shows, that’s when exit velocity begins to “matter.” Another way of saying that is that balls hit at 40 mph or 70 mph will affect your average exit velocity differently, but in terms of outcomes, they’re just two varieties of weakly hit balls. For true production, you need to get to 95 mph. You can see the value when you look at the 2018 MLB outcomes for hard-hit balls (95 mph+) and weakly-hit balls (below 95 mph). TLDR: While this may seem like common sense to some people, the number REALLY support this. Look at this chart. The harder you hit a ball, it’s extremely more likely to be a hit. This morning, Yankee’s skipper Aaron Boone told reporters that ace Severino had some discomfort in his throwing shoulder, and he would be missing his spring training start. He went in for an MRI to check everything, and it was found that he did indeed have inflammation. He will be waiting two week until he throws again. Assuming that he would have made another opening day start, this really makes it difficult to make that start. “Major League Baseball and the MLB Players Association have spent the winter negotiating over rules changes while publicly bickering over the operation of the player market. The sides now appear to be nearing agreement on a package of new rules, per Ken Rosenthal of The Athletic (Twitter link), though it’s not likely to address the broader concerns. San Francisco Giants outfielder Cameron Maybin was arrested early Friday morning in Scottsdale, Arizona, for two DUI offenses — driving while impaired and driving with a blood alcohol content of .08 or more. Tests on the scene determined that Maybin’s BAC was .127. Left-hander Gio Gonzalez had at least been discussed “by some Yankees people” even before the team learned of Luis Severino’s rotator cuff inflammation earlier today, tweets MLB Network’s Jon Heyman. Similarly, Mark Feinsand of MLB.com reports that the Yankees do like Gonzalez and may inquire with agent Scott Boras about the lefty’s current asking price. “Twins third baseman Miguel Sano will not be prepared for Opening Day and could miss the first month of the season, chief baseball officer Derek Falvey told reporters including Phil Miller of the Star Tribune (via Twitter) and Betsy Helfand of the St. Paul Pioneer-Press (Twitter link). A cut on Sano’s foot has kept him out of action throughout camp. That injury, sustained during a celebration of a Dominican Winter League title, required a second debridement procedure to clean up the wound. Created by Tom Tango, Leverage Index measures the importance of a particular event by quantifying the extent to which win probability could change on said event, with 1.0 representing a neutral situation. For instance, if a team trailing by three runs had the bases loaded with two outs in the eighth inning, the ensuing plate appearance would register an LI above 1.0. This is because the outcome of the game could dramatically change on that one plate appearance. Conversely, if a team trailing by four runs has a man on first with one out in the top of the ninth inning, the ensuing plate appearance would register an LI below 1.0. LI can be used to more easily pinpoint the pivotal moments in a particular game and determine how often players face high-leverage situations.